Julia Child once famously admonished North American bread, equating it to Kleenex. While that might not be true, it can certainly be said for many of the Paleo and low-carb bread options available in most grocery stores. 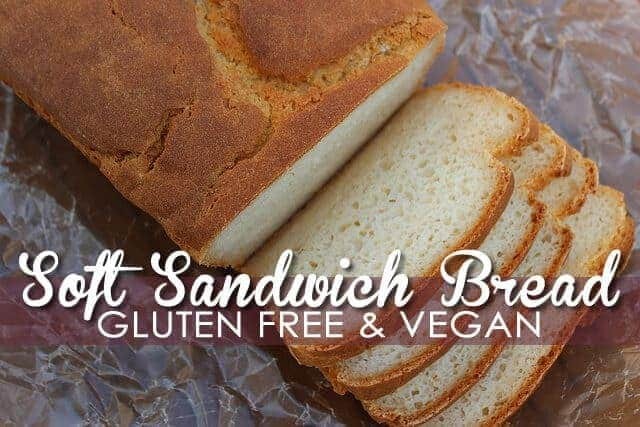 Unfortunately, many of these gluten- and grain-free breads just don’t hold a candle to the breads available to those who aren’t limited by their Paleo, ketogenic or gluten-free lifestyles. 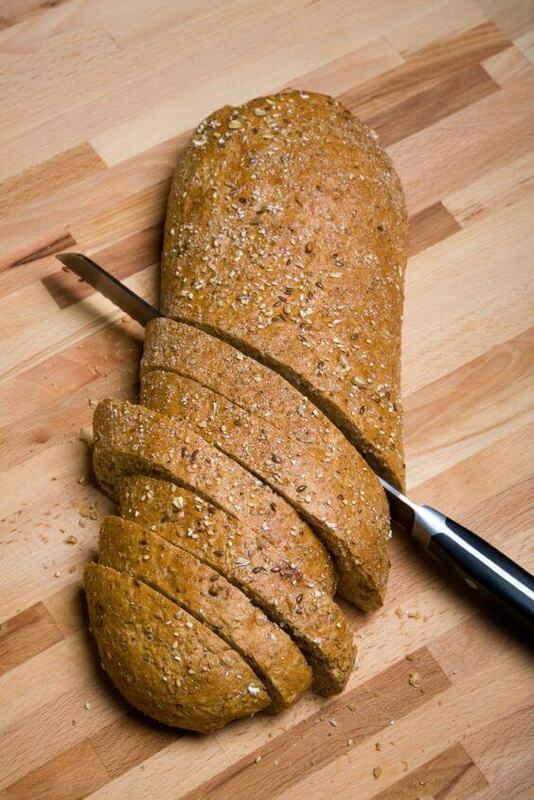 Many people on the Paleo plan have simply given up on the idea of having bread in their diets. Frankly, it’s hard to think of anything more depressing. Bread is a delicious staple, a hearty cornerstone to any meal. If the breads available to you at the grocery store aren’t up to par, then the solution is simple: Make your own! You’ve probably always imagined bread-making to be a complex, arduous ordeal. This is true of traditional breads, many of which require rising time and special bread-making devices. 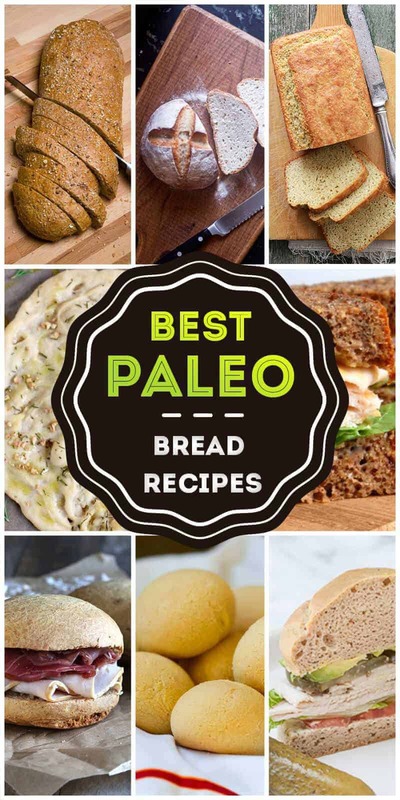 However, Paleo breads are actually some of the easiest recipes on the planet. Even if you aren’t a natural in the kitchen, most of these recipes are difficult, if not impossible, to botch. It’s time to bring bread back into your life. 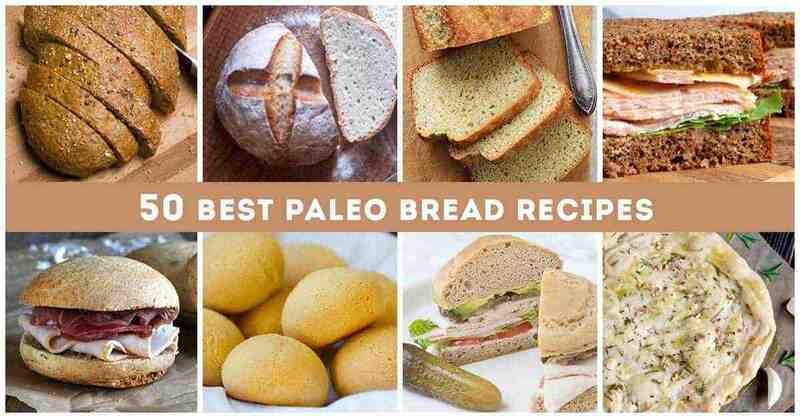 Here are 50 Paleo breads that are simple to make, low-carb, nutritious and, most importantly, absolutely delicious to eat. There’s no better way to start the day than with a hearty slice of multigrain toast. On a Paleo Diet, however, many multigrain breads are off-limits. 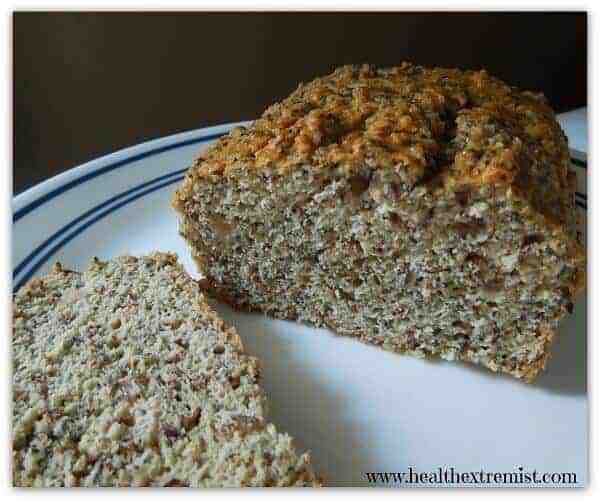 Solve that problem by preparing this incredibly healthy bread yourself. 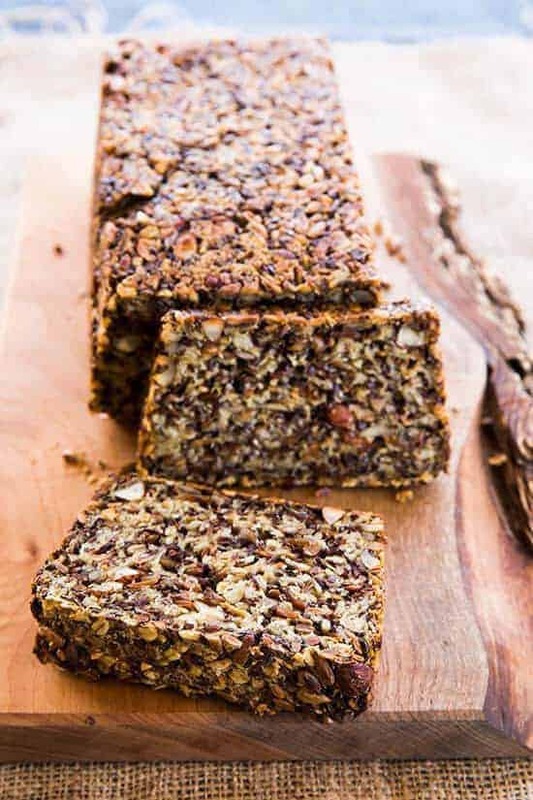 Thanks to the inclusion of whole flaxseeds, this bread is chocked full of fiber and heart-healthy omega-3s. This bread is served perfectly as breakfast toast, giving you an energizing and healthy start to the day ahead. If there’s anything people find themselves missing on a Paleo plan, it’s a fluffy, buttery roll served with their dinner. Forget what you’ve heard about having to give up indulgences like these. This totally Paleo roll recipe will let you bring this staple back to your dinner table. 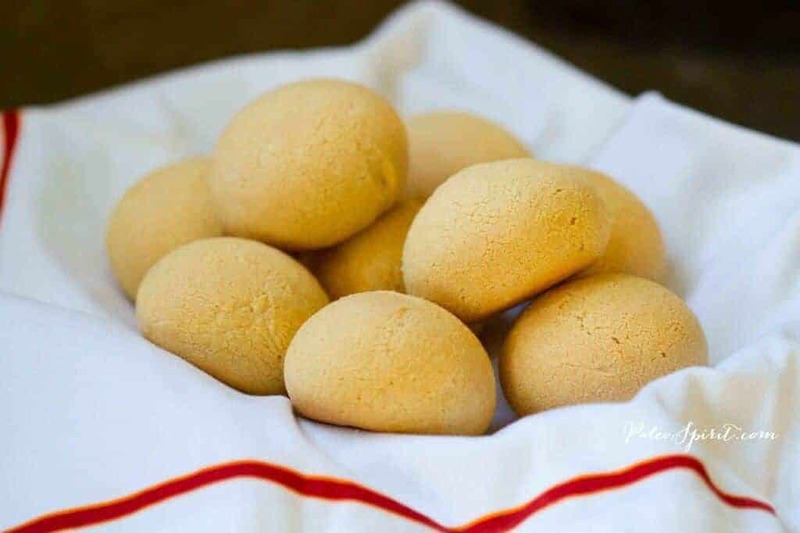 The recipe is surprisingly simple and employs tapioca flour to give these rolls a light and fluffy finish. Add a small pat of grass-fed butter for a delectable dinnertime treat. There’s nothing better than a spicy and hearty curry dish. However, Indian food lovers on the Paleo plan might miss using a tasty piece of naan to scoop up their sauce. Thankfully, this naan recipe allows those on the Paleo Diet to enjoy this staple of Indian cuisine. The best part? This recipe only requires three simple ingredients. It can also be served with fruit or jelly as a sweet morning treat. Life’s not worth living without the occasional taco night. Don’t think that your Paleo Diet prevents you from enjoying tacos any longer. 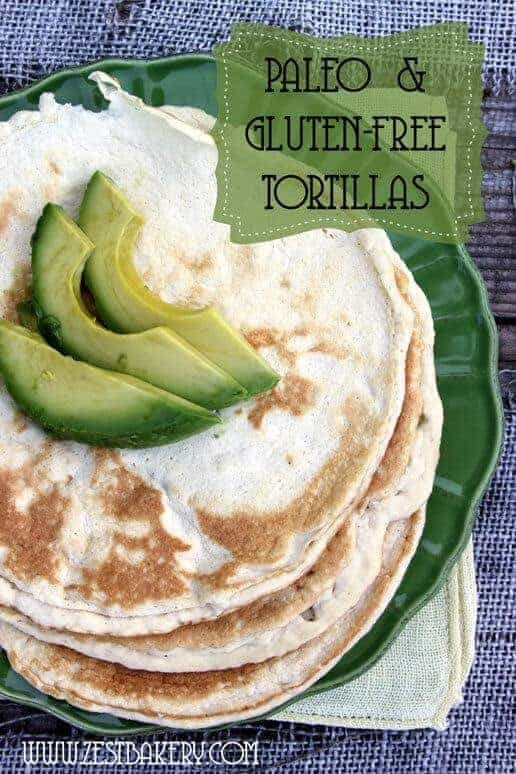 This tortilla recipe is both grain- and gluten-free, making it a perfect choice for a wide array of food allergies and sensitivities. 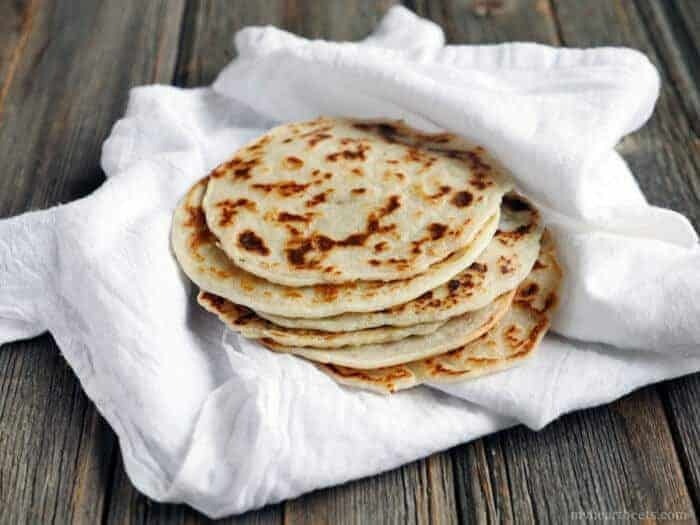 Coconut flour ensures that these tortillas are light, pliable and easy to roll into burritos. Fill with your favorite protein and fresh salsa and guacamole for a taco that is not only Paleo-friendly, but delectable to boot. There’s nothing more classic than a plate of flaky biscuits, served with fried eggs or a sausage gravy. 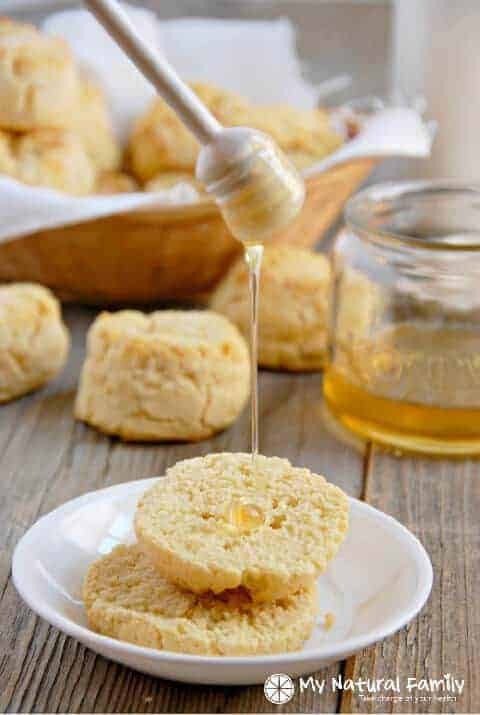 While most biscuit mixes you’ll find at the grocery store are jam-packed with unhealthy ingredients, this recipe for Paleo biscuits allows you to enjoy this classic breakfast food whenever you wish. Almond flour gives them a flavor that is rich but not overpowering. Serve with grass-fed butter or use them to scoop up your favorite Paleo sauces. 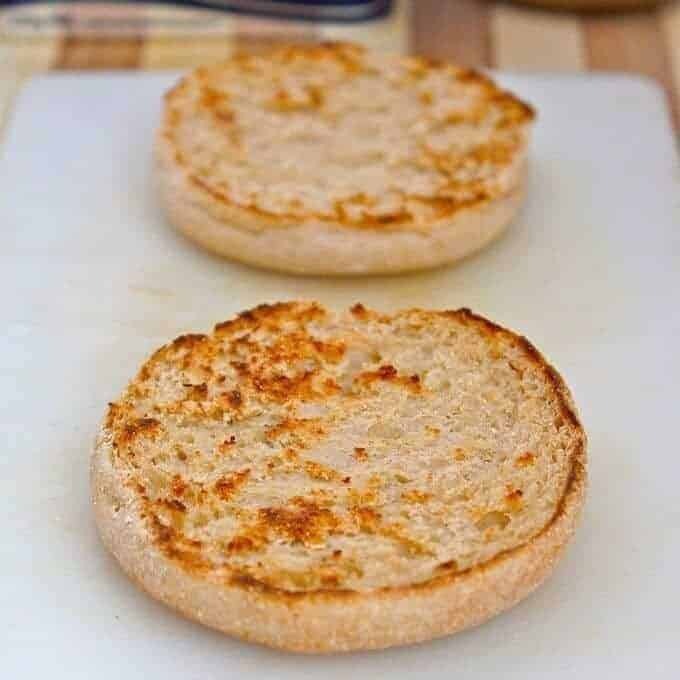 English muffins are ideal for a quick and simple breakfast food. However, most aren’t ideal for a Paleo plan. These English Muffins aren’t just Paleo-friendly, but vegan as well. 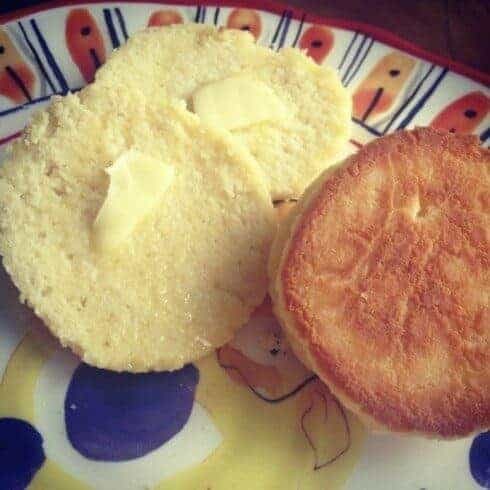 Shockingly, these English Muffins don’t even require an oven to bake, as the recipe is entirely microwavable. Keep a few in the fridge for a perfect breakfast on those mornings when you’re rushing to get to school or work. Or, use them to make a Paleo version of the classic Eggs Benedict on those lazy Sunday mornings. Zucchini bread is a delightful, rustic dish that pairs perfectly with pasta dishes. This Paleo version eliminates white flour in favor of almond flour. Banana, cinnamon and nutmeg give it a sweet tang. Serve alongside a corn pasta in a red sauce for an incredibly hearty dinner. It’s also delicious on its own with a pat of grass-fed butter. If you’re trying to build muscle, you know that protein is essential for meeting your fitness goals. While most of us turn to meat or shakes to get our protein fix, there are unique ways to pack in the protein if you’re creative. This high-protein bread is one of those ways. 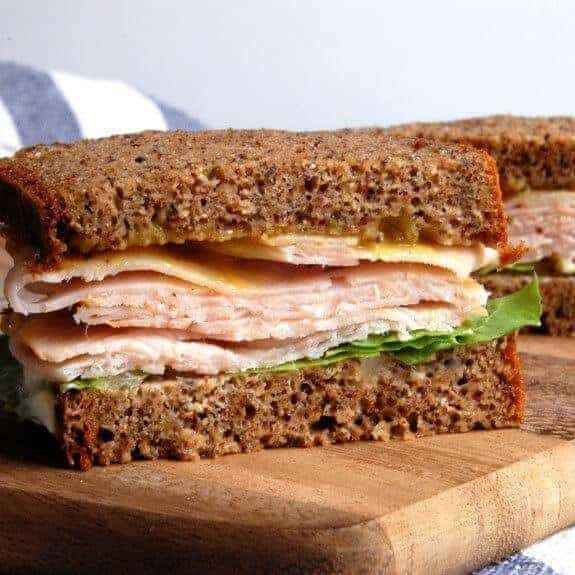 Thanks to an abundance of seeds and flaxseed, this bread is a perfect way to boost the protein in your lunchtime sandwich. Seeds should be an essential part of any Paleo diet. They’re one of nature’s most perfect foods. They provide your body with healthy fats, omega-3s and the nutrients you need to perform at your absolute best. 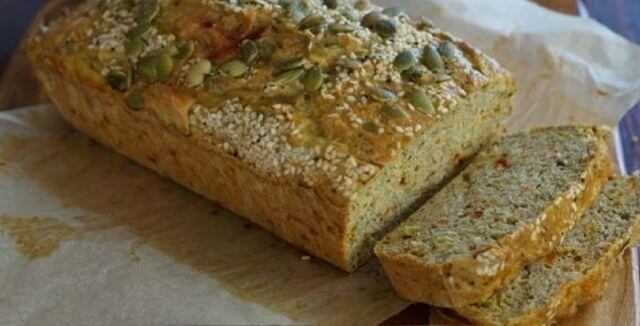 This bread contains pumpkin, chia and sunflower seeds. The finished product has a nutty and robust flavor. It’s perfect for a lunchtime sandwich or served alongside dinner. 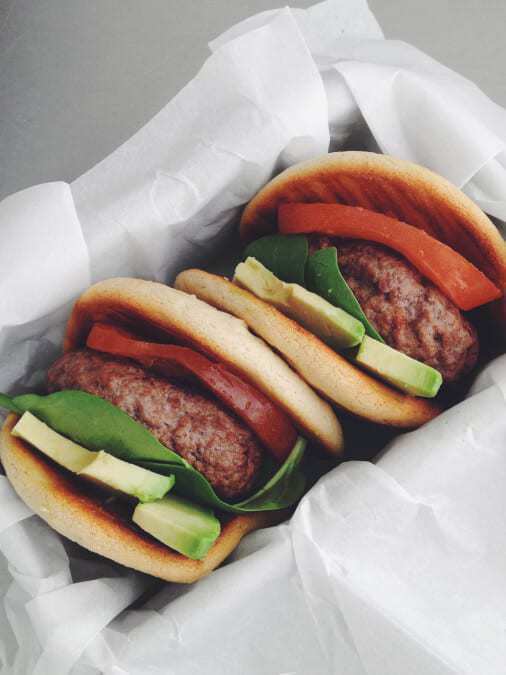 If you’ve been eating your burgers and hot dogs naked for fear of gluten and grain, the time has finally come for you to bring buns back to your barbecues. These buns are low-carb, making them idea for both Paleo and ketogenic diets. They are light and fluffy, thanks to the inclusion of protein-packed egg whites in the recipe. These buns can easily be made in both burger- and hot dog-sizes. 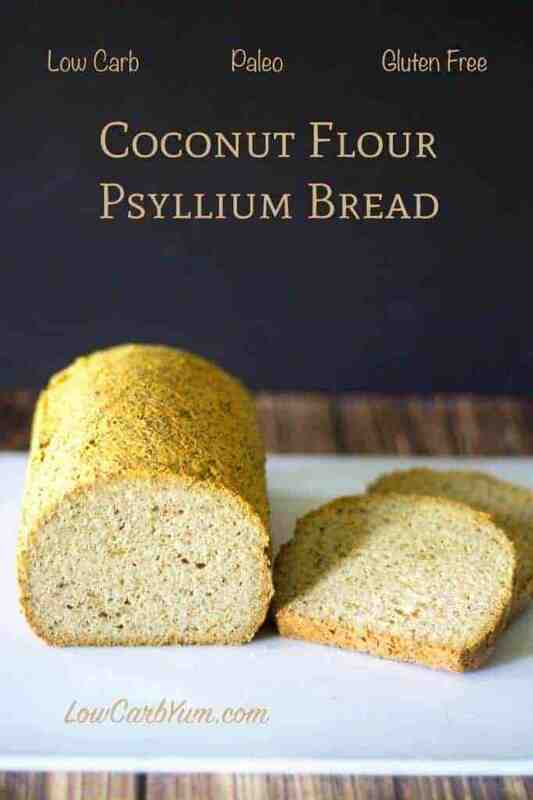 Like so many Paleo bread recipes, this one used coconut flour in lieu of ordinary white or grain flour. Coconut flour is not only a much healthier choice, but it gives the finished product a fluffy texture and a slightly sweet flavor. This recipe is unique in that the bread can be made in a wide array of sizes. Larger sizes are great for sandwiches, while smaller sizes are perfect for dinner roll-sized snacks. No one wants to give up the option of having a quick and simple sandwich when they’re hungry, no matter what diet plan they’re on. This Paleo bread recipe yields sandwich rolls that are utterly indistinguishable from the real deal. Whip up a large batch and be sure to keep your fridge fully stocked. All you need is some deli meat and some veggies and you have a delicious, quick and simple lunch. Nothing says gourmet quite like a flavorful, artisanal flatbread. 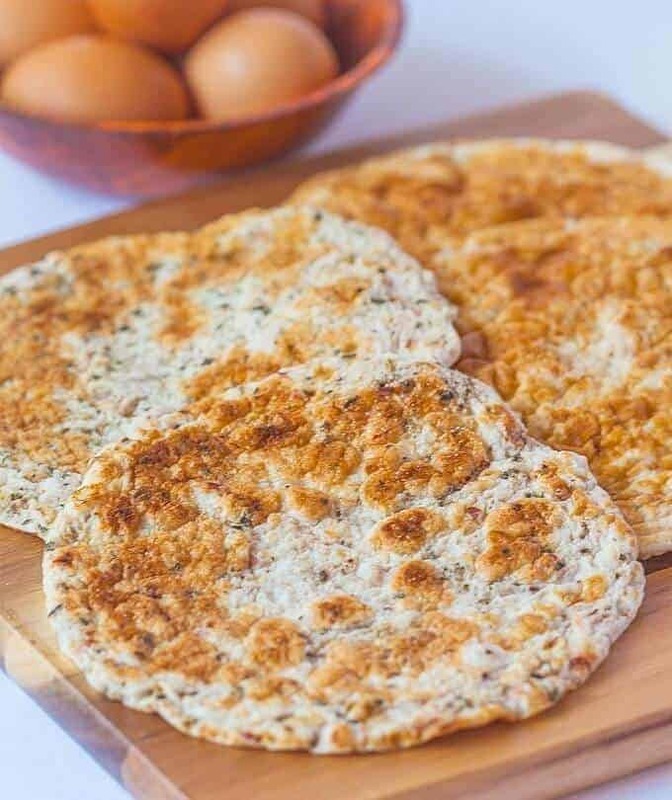 This recipe for Paleo flatbread is a perfect way to enjoy this yummy bread on the Paleo plan. It uses only three ingredients and the finished product is robust and delightfully chewy. It’s great served alongside dinner, but can also be used as the foundation for a delicious Paleo Margherita pizza. Add garlic salt and oregano to the dough to give it an Italian twist. 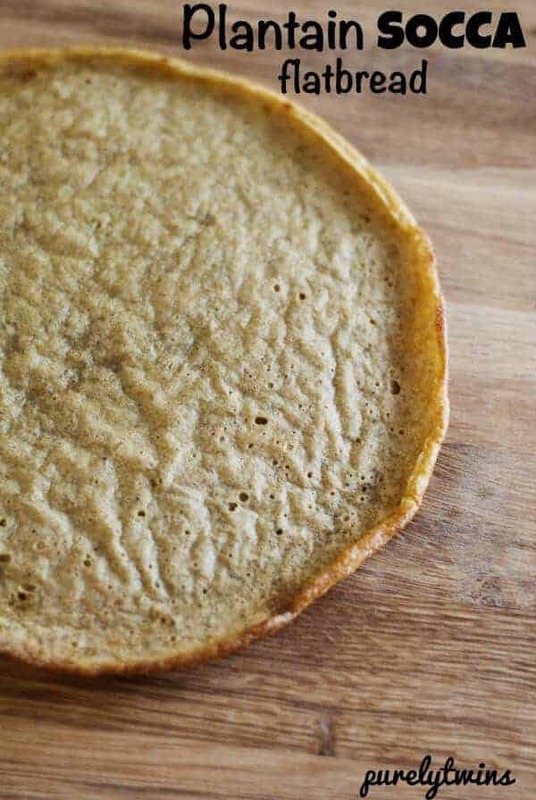 This recipe employs many of the staples that we see in so many Paleo foods: coconut flour, oil and flaxseed. This recipe yields a bread that has both a sweet and nutty flavor. 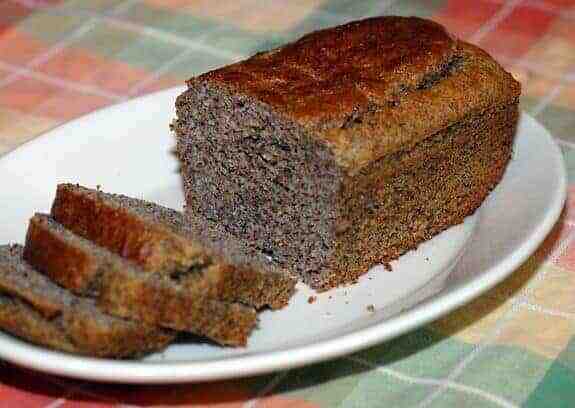 It is a great basic recipe that can be used to substitute the bread in just about any dish. It’s firm enough to use for sandwiches, but soft enough to serve alongside dinner. Plantains are a real treat for anyone following the Paleo plan. These fruits can be used to prepare both sweet and savory dishes. This Paleo bread recipe uses plantains to give this flatbread a light texture and a sweet taste. While it’s perfect on its own, serve it alongside sugar-free jam and grass-fed butter for a truly delectable midday snack. As an added bonus, the plantains are packed full of B, C and A vitamins. Some many find many Paleo bread recipes to yield too sweet of a taste. This is because Paleo bread recipes frequently rely on ingredients like coconut flour, which have an inherently sweet taste. This sandwich bread is perfect for those who’d prefer little to no sweetness in their bread. The recipe uses golden flaxseed meal, which gives it a firm texture and little to no sweetness. Life’s too short not to enjoy French bread! This heavenly and perfectly Paleo recipe yields a finished product that delivers what we all want from a French bread: crunchy and chewy on the outside, light and fluffy on the inside. Furthermore, it has the yeasty flavor of a traditional loaf, rather than the light sweetness found in many Paleo bread recipes. It pairs beautifully with grass-fed butter, providing you with a completely guilt-free indulgence. 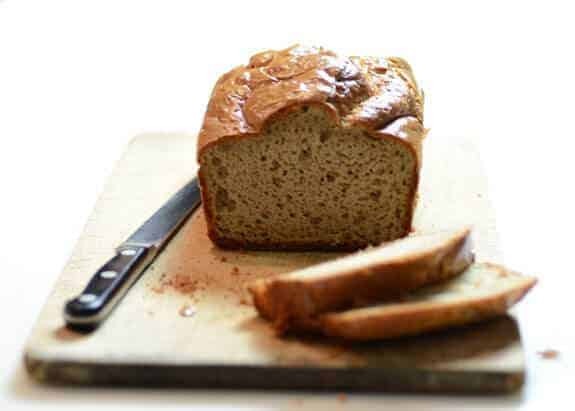 This bread, designed to be prepared as a simple sandwich loaf, uses unsweetened almond butter. This results in a bread that has a nutty flavor without an overpowering sugariness. The inclusion of almond butter will help you to meet your protein goals without packing in excessive calories or fat. The recipe also utilizes milk kefir, making it a perfect source of calcium, antioxidants and live cultures. This recipe would be a great first start for someone who is new to the world of making Paleo bread. It uses very basic ingredients and is ready in as short as a half hour. If you find the finished product a bit too sweet for your liking, substitute the almond butter for an unsweetened version. This bread is great for preparing sandwiches or served as a healthy toast as breakfast. This French bread recipe is completely wheat- and gluten-free. 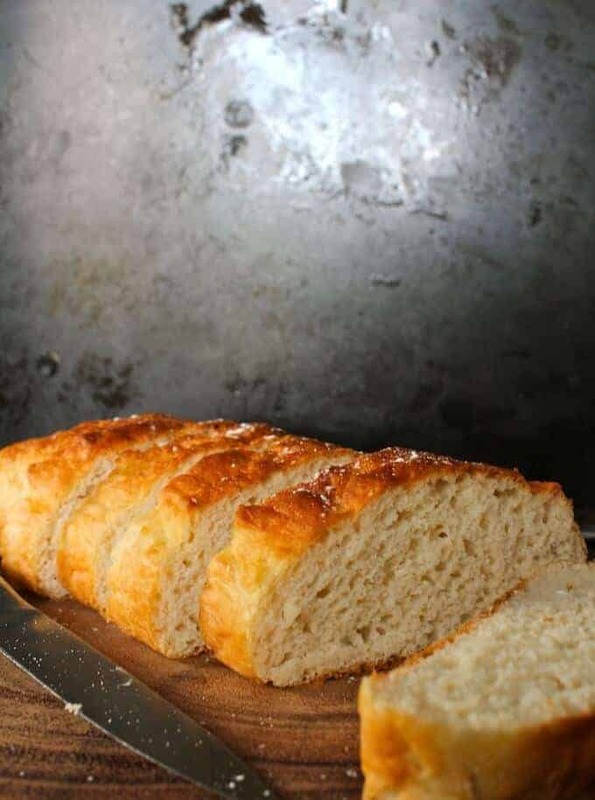 Despite being completely Paleo, it yields an extremely crunchy exterior that will be a delight for anyone who loves a classic bakery French bread. If you’re having a hard time finding the required xantham gum – this is integral for that crunchy exterior – try checking at specialty markets or online. This one takes a bit of effort, but the finished result is completely worth it. This bread is the ideal choice if you live in a household full of people with varying diets and food sensitivities. It’s wheat-, dairy-, grain-, sugar- and yeast-free. Furthermore, it’s extremely low in carbs. However, just because this bread is so extremely healthy doesn’t mean that it isn’t full of flavor. The use of flax and almond flour give it a hearty, robust and lightly sweet finish. Just because you’re eschewing gluten in favor of healthier ingredients doesn’t mean that you have to sacrifice flavor. This Paleo bread is not only easy to make, but it’s incredibly healthy and has an amazing flavor. The needed Celtic sea salt can be found in most health food stores. However, if you’re having a hard time finding it, substituting it for regular sea salt will be just fine. Avoiding starchy foods is a great way to banish bloating, feel more energetic and shed those unwanted pounds. However, it’s easy to miss bread when you’re on a starch-free plan. 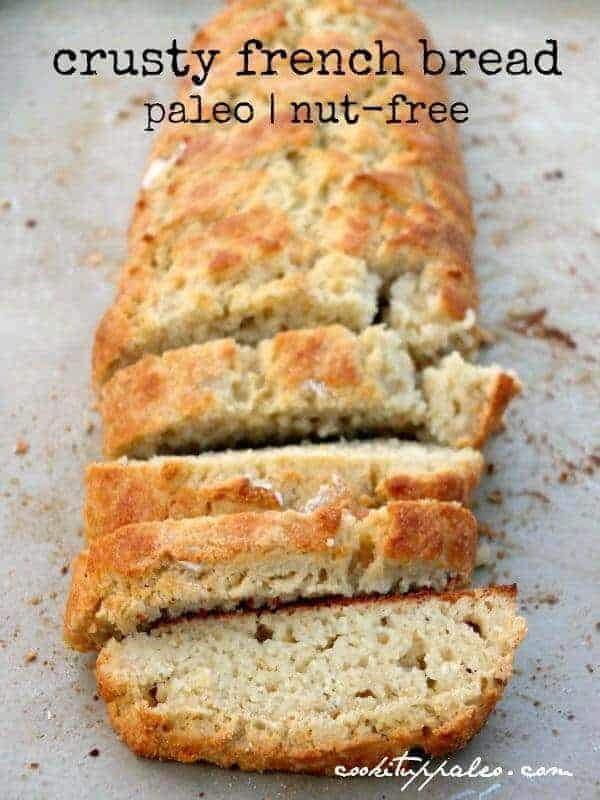 This delicious Paleo bread recipe allows you to enjoy bread without going back to the starch that makes you sluggish. Use butter if you want the bread to have a more savory finish or coconut oil if you prefer something lighter and sweeter. 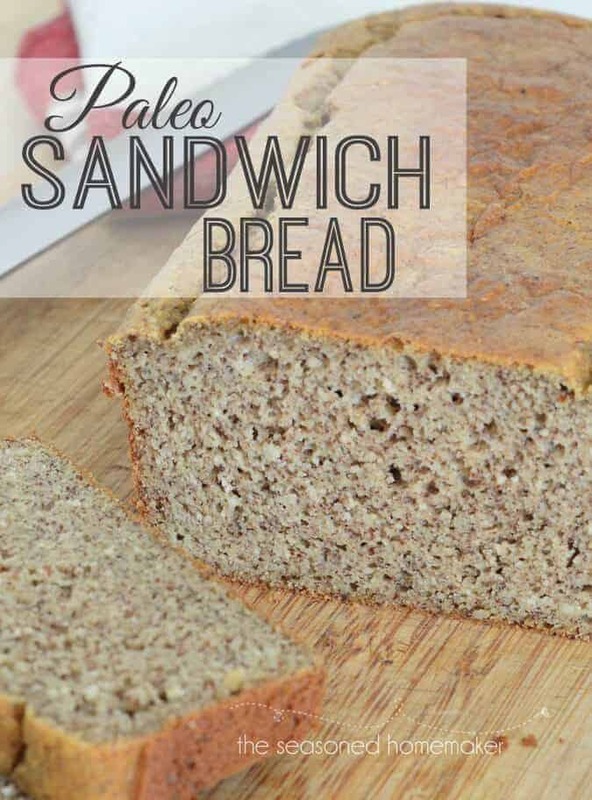 Not all Paleo bread recipes are simple solutions for sandwiches! 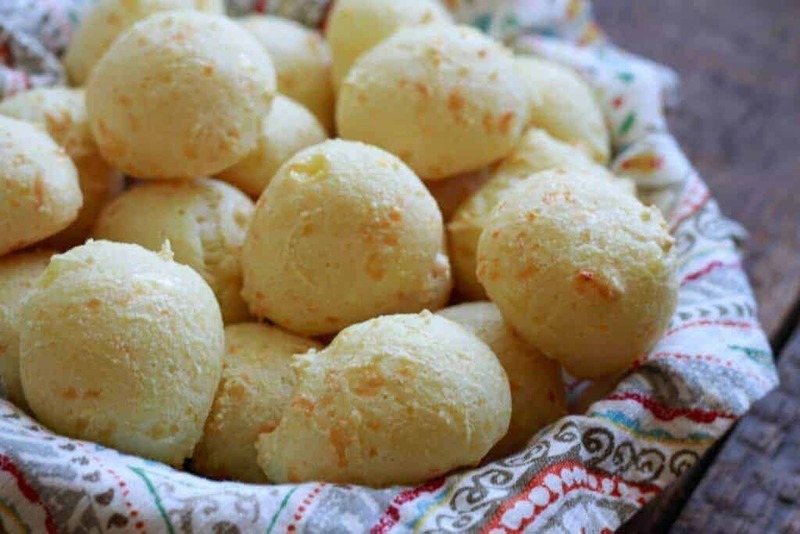 The unique and completely grain-free Brazilian cheese bread recipe packs a wallop of flavor without any ingredients that are forbidden on the Paleo plan. Thanks to the Parmesan cheese, it’s the perfect addition to any Italian dinner. Or, enjoy alone for a delicious and savory snack. These little cheesy bread balls will put the fun back into your Paleo lifestyle. 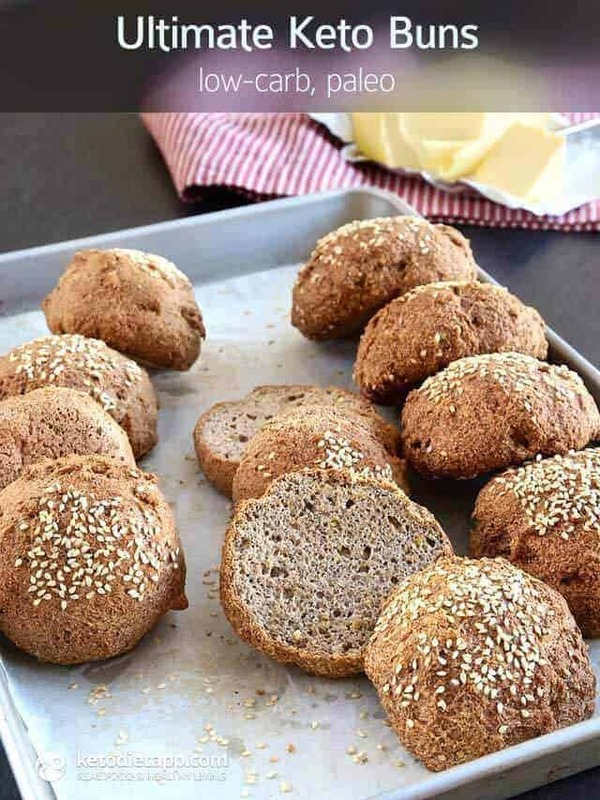 While these stupendous Paleo rolls can also be used for burgers and deli meats, this recipe lends itself beautifully to a breakfast sandwich. These rolls have the same texture and flavor as the sandwich rolls used in cafe breakfasts. For a delectable morning treat, fill one of these hearty and nutritious rolls with thinly sliced ham and a fried egg. This bread isn’t ideal for sandwiches, as it’s crumbly and flaky. However, if you’re looking for an amazing bread to serve alongside a creamy and robust dinner, this is it. Thanks to the raw honey and coconut oil, it has a heartily sweet finish, similar to a cornbread. Arrowroot powder can be added to make this sweet bread even lighter and fluffier. This is yet another Paleo bread recipe that proves that deliciousness isn’t reserved for traditional grain and gluten breads. 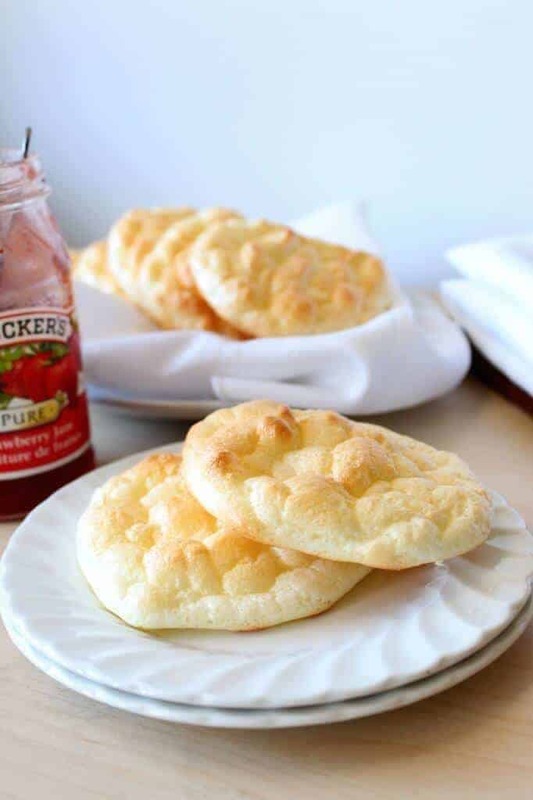 This recipe is called “Pillowy Light Cloud Bread” for good reason. It yields a bread that is extremely light, ensuring that you won’t feel sluggish or weighed down. Not only is it chocked full of protein and extremely low in carbs, but it’s incredibly easy to make and prepare. It can be used to prepare a light sandwich or served with sugar-free jam for a truly delicious snack. If you’re a fan of zucchini breads, you’ll never feel left out on the Paleo plan. 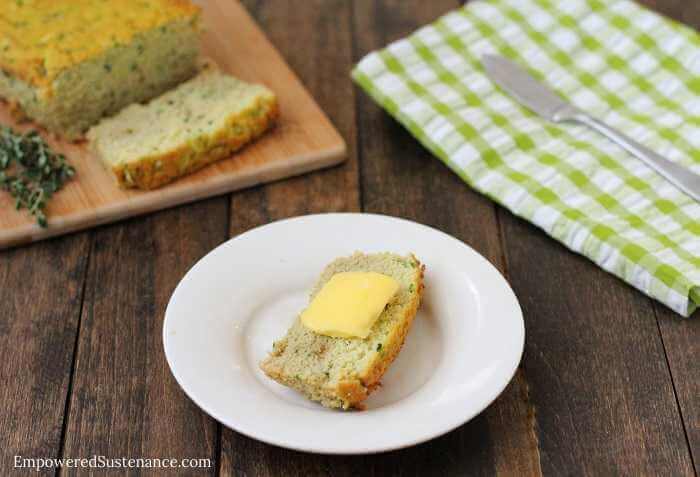 The basic zucchini bread recipe lends itself well to Paleo substitutions. 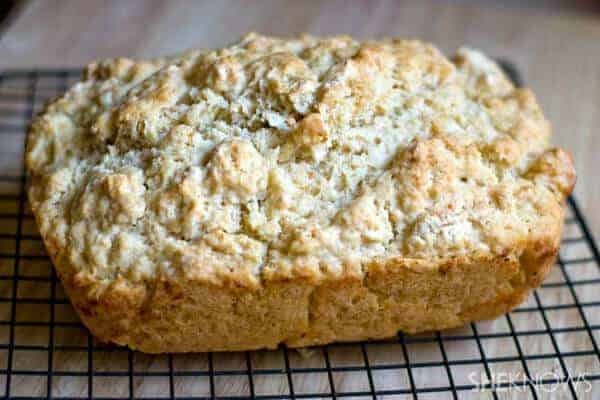 In lieu of grain and gluten, this bread recipe uses coconut flour, the sweetness of which juxtaposes beautifully with the savory flavor of the zucchini. When served with a pat of grass-fed butter, this garden fresh bread becomes an absolute dream for the tastebuds. Wonderbread is one of those childhood staples that we all know we must give up in adulthood. Although it’s delicious, it’s packed full of unhealthy ingredients. 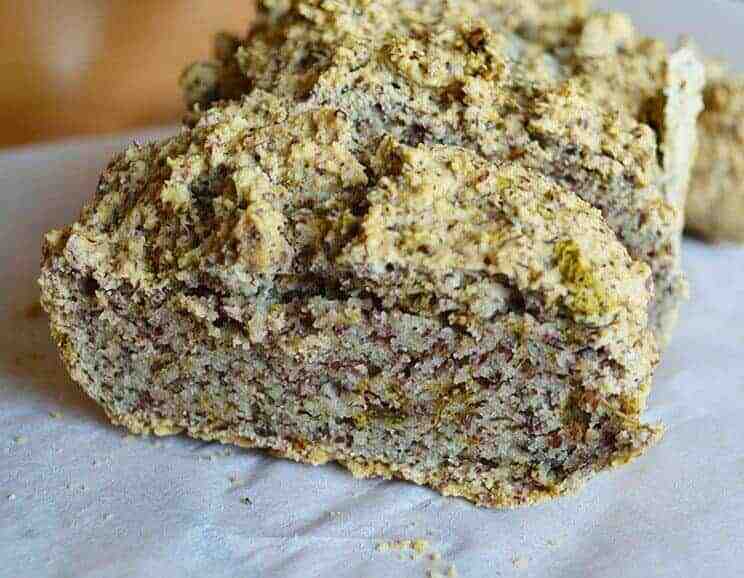 This Paleo sandwich bread is a perfect dupe for Wonderbread, without the chemical processing and icky ingredients. It’s firm enough to prepare a sandwich with, but light and fluffy enough to be confused for classic grocery store white bread. It’s delicious with deli meats, veggies and, if your diet allows, a thin slice of cheese. 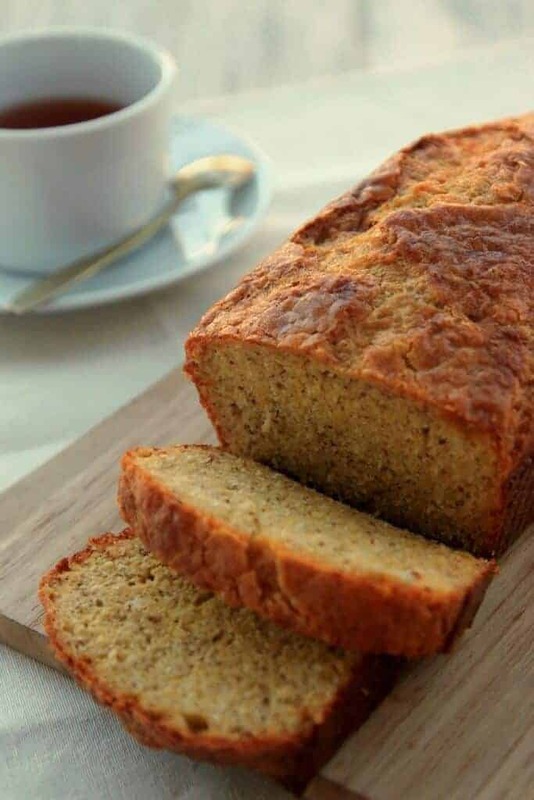 The presentation of this gorgeous Paleo loaf is a big part of this recipe’s wow factor. Although it’s completely gluten-free, it’s identical to the classic artisan loafs that you’d find in any gourmet bakery. This recipe uses a distinct flour mixture that includes tapioca flour, rice flour and potato starch. The finished product is incredibly hearty, rustic and robust, with a slightly nutty aftertaste. This one requires a bit of effort, but the finished product is entirely worth it. If you’re really trying to keep your carb intake down, this bread is perfect for you. In lieu of carb-heavy ingredients, this bread uses eggs, coconut and olive oil to give the finished product a light but chewy finished texture. It’s firm enough to be used for sandwiches, but soft enough to be enjoyed alongside dinner. The whole psyllium husks can be found at a wide variety of health food stores and can be used in the preparation of many Paleo foods. Cashews should be a cornerstone ingredient in any Paleo plan. They are loaded with heart-healthy vitamins and antioxidants. Furthermore, they give just about any food a creamy, smooth texture. This cashew bread is no exception. 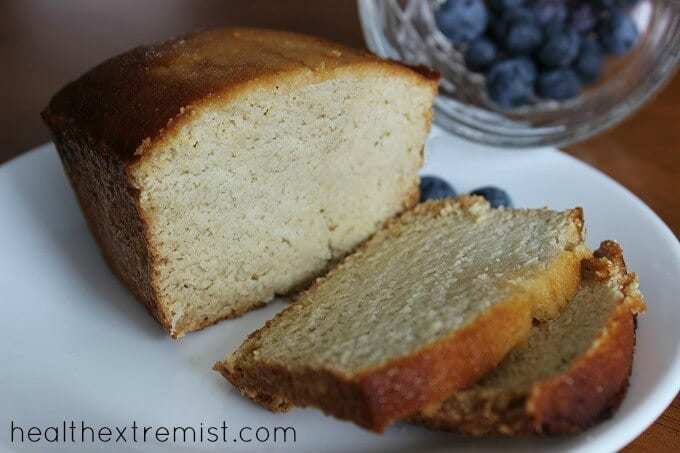 This Paleo recipe yields a bread that is smooth, slightly flaky and a little bit sweet. As an added bonus, the cashew butter and the eggs combine to create a bread that is loaded with protein. Have you ever heard of Soul Bread? If not, you’re missing out. This is a popular recipe for those who follow a ketogenic diet. Thankfully, this take on Soul Bread is completely Paleo-friendly. It’s extremely low in carbs, perhaps the most low-carb option on this list. 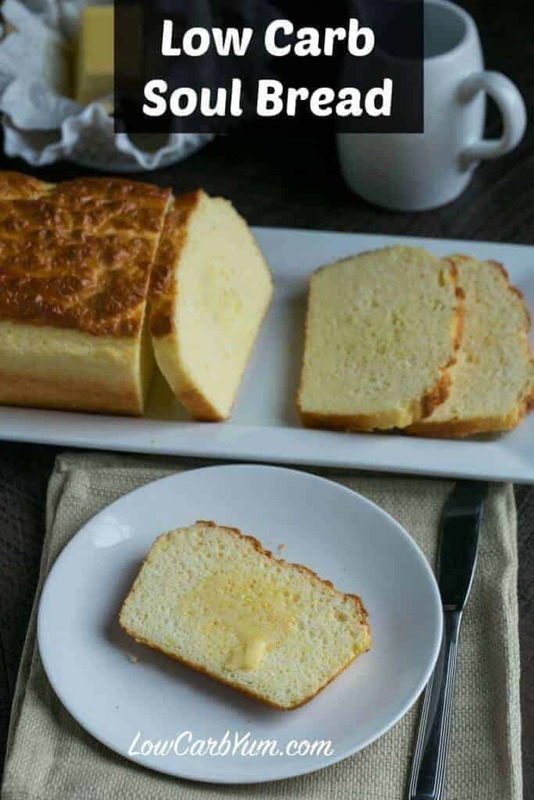 The use of cream cheese in the recipe gives the bread a buttery, smooth finish. 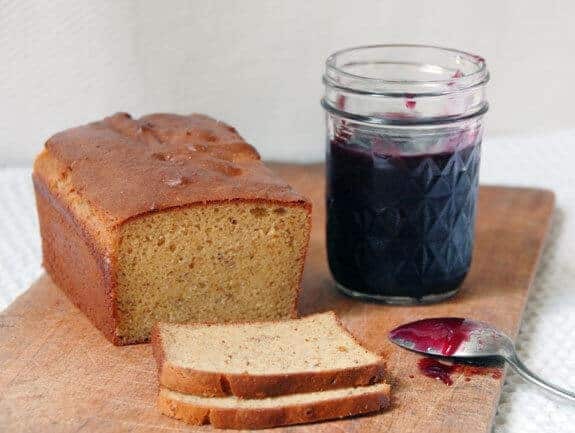 Serve with sugar-free jam or jelly for a deliciously savory and sweet treat. If you’re under the impression that the best Paleo foods for breakfast are the old standards like eggs and meats, you’re mistaken. You can enjoy just about any breakfast food on a Paleo plan, provided that you know some smart kitchen hacks. 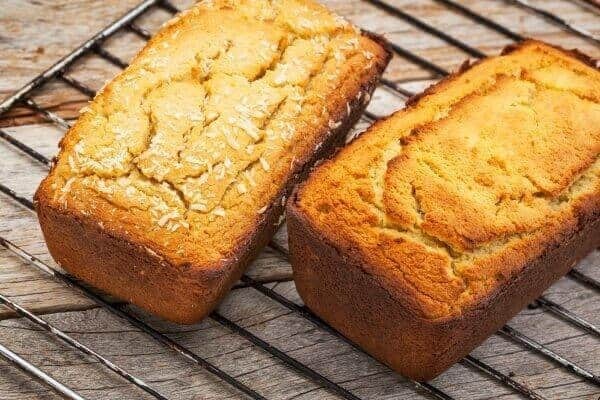 This coconut flour bread recipe creates a Paleo loaf that was practically made for breakfast. Top with coconut butter, almond butter or sugar-free jam for a light and crumbly morning treat. Or, for something more savory, top a slice with an over-easy egg. Are you looking for a simple and easy-to-make bread that isn’t too sweet or too savory? This is the perfect Paleo recipe for you, then. This recipe is great for those who are new to the world of bread-making and have some reservations. 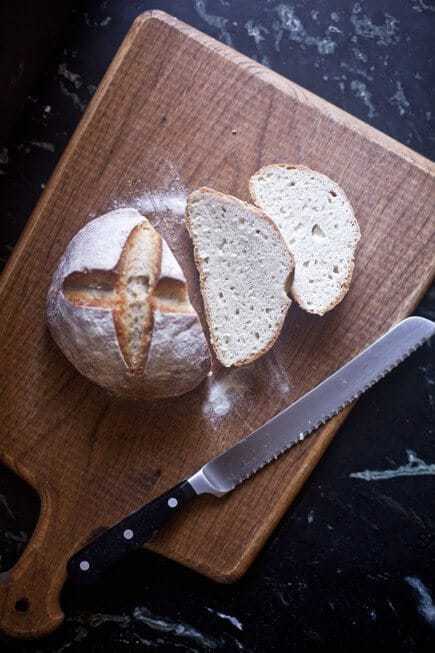 It’s incredibly simple to prepare and the finished ingredient is basic enough to be used as a substitution for just about any dish that features bread. Many people on Paleo or ketogenic diets prefer to make meat the bulk of their meal. If you like your burgers to dominate the show but still want a little taste of bread, this is the ideal recipe for you. The finished product is less like a burger bun and almost more like a sandwich thin. However, its light and slightly savory flavor pairs with red meat brilliantly. These buns can also be used to prepare sandwiches with deli meats and vegetables for a fast and easy snack. 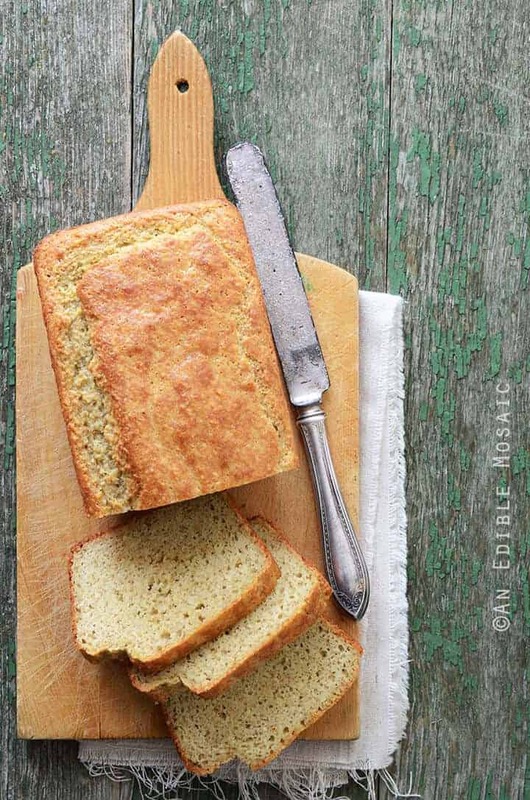 Cornbread is essential in just about any Southern dish. Barbecuing a rack of ribs isn’t quite the same if you don’t have some delicious cornbread to serve alongside it. The dash of garlic powder and coconut oil combine beautifully, giving this cornbread a delightfully sweet yet hearty finish. Cornbread wouldn’t be cornbread without a smear of butter; keep it Paleo by using a heart-healthy grass-fed butter instead of the regular stuff. When people make the decision to switch to Paleo foods, they usually assume that their life will be full of meats, veggies and not a whole lot of crunch. When it comes to eating Paleo, all it takes is the right tips, tricks and substitutions. 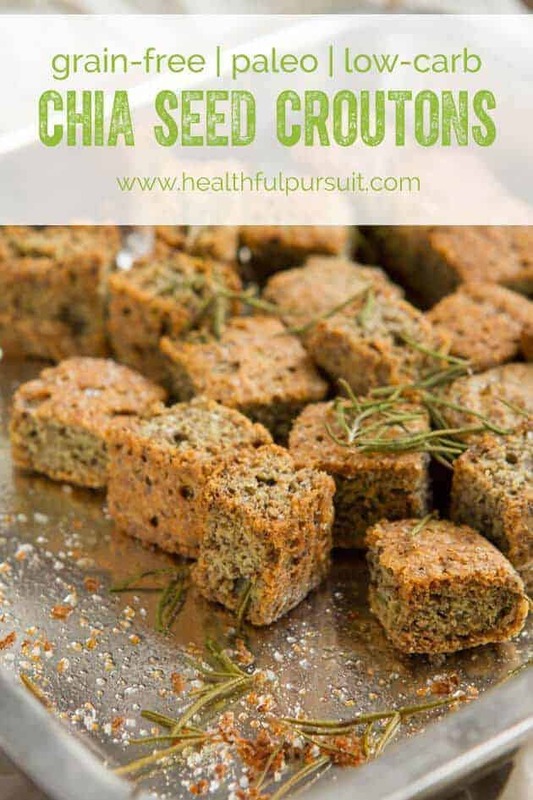 These grain-free chia seed croutons will bring the crunch and texture back to your lunchtime salads. They’re slightly salty and abundantly flavorful, thanks to the unique use of rosemary in the recipe. 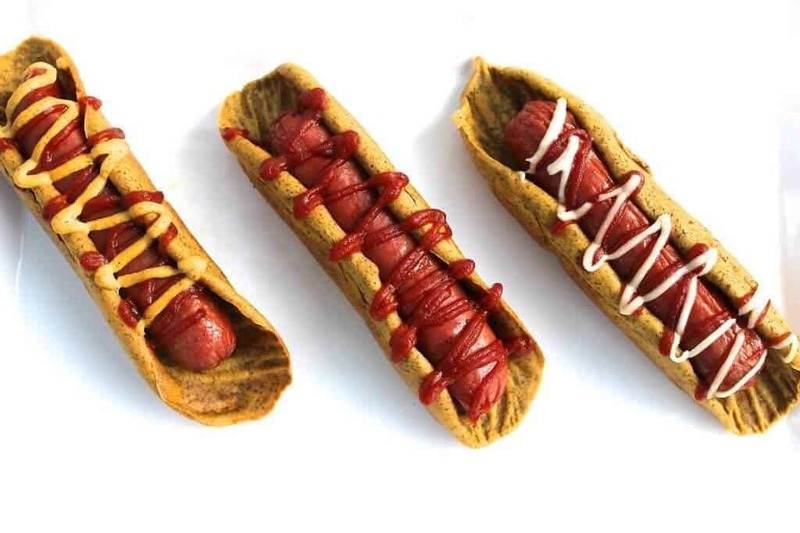 Hot dogs are a tasty way to get some protein into your diet. However, hot dog buns, on the other hand, are full of starch, gluten and other unhealthy ingredients. Bring hot dogs back into your life by making these easy but delicious Paleo hot dog buns. The use of mashed sweet potato in the recipe gives these buns that light, fluffy and vaguely sweet flavor that are unique to hot dog buns. 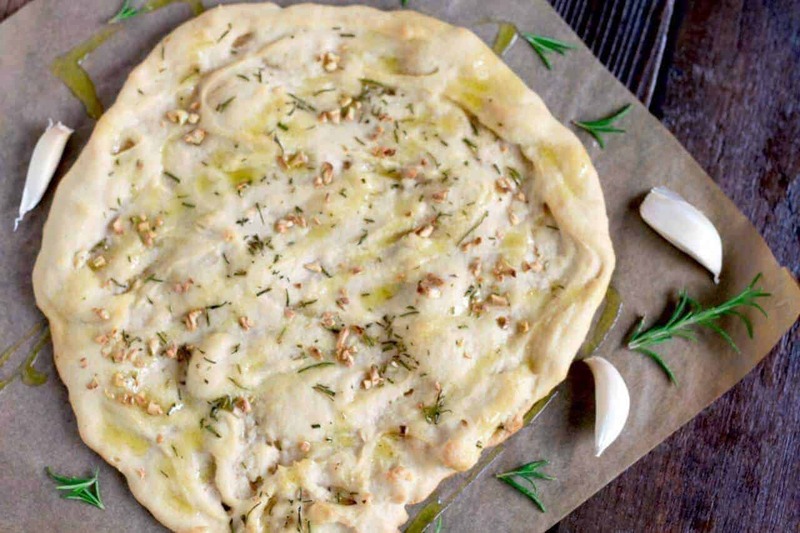 This rosemary garlic flatbread is so delightful that you’d want to eat it even if you weren’t on a Paleo plan. It accompanies a hearty dinner spectacularly and can also be enjoyed on its own. When baked on a pizza stone, it’s truly phenomenal. The finished product is crispy on the outside, yet warm, robust and chewy on the inside. This flatbread is a wonderful dish that provides an abundance of flavor without any unhealthy ingredients. If you want to give your sandwich a restaurant feel, opt for a roll instead of a regular slice of bread. 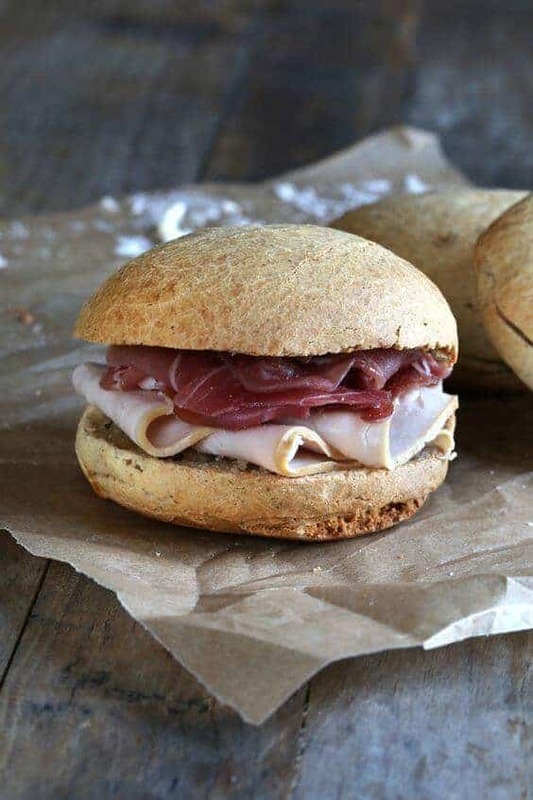 These Paleo sandwich rolls will help you to make sandwiches worthy of your favorite deli. 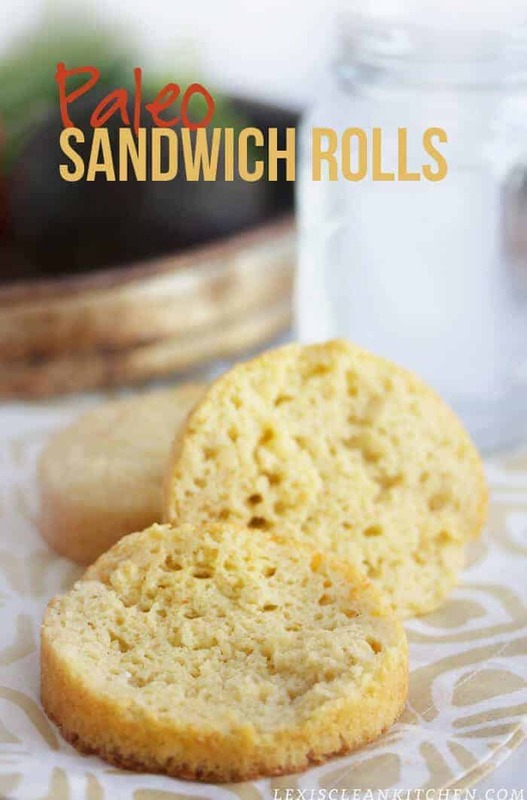 The use of arrowroot powder ensures that these sandwich rolls have a firm texture, unlike so many of the Paleo breads that tend to be on the flaky and crumbly side. No matter what you put between these buns, it’s sure to be delicious. The sweetness of a biscuit pairs wonderfully with any savory dish. 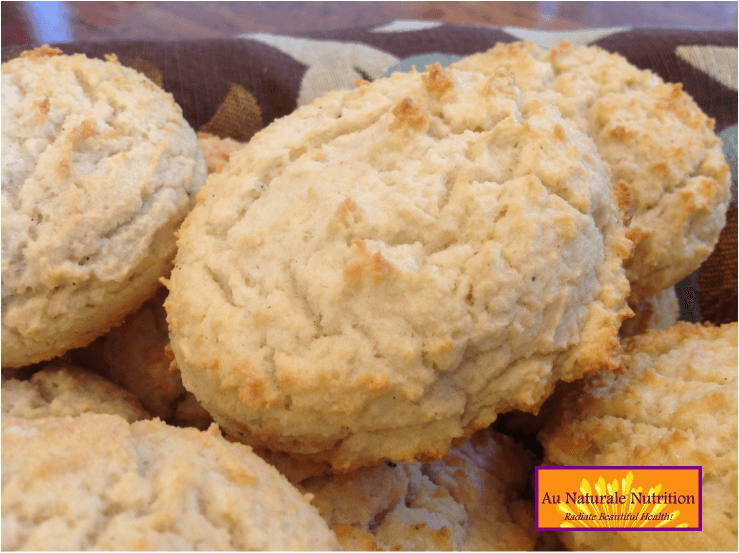 These tasty Paleo biscuits go great with chicken, steak and Paleo gravies. They can also be enjoyed on their own; the author suggests enjoying them with a drizzle of honey for a fast snack. The use of almond, tapioca and coconut flour give them their delightfully chewy texture. The splash of coconut milk gives them the distinct sweetness that people expect from a good biscuit. Sourdough is one of the most popular choices at any bakery. There’s nothing better than a buttered slice of classic sourdough to accompany a salad or soup. This Paleo sourdough recipe is grain- and wheat-free, in addition to being quite low in carbs. The tangy flavor and chewy consistency can be chalked up to the use of cashews in this surprisingly delicious Paleo recipe. The cashews are also responsible for this bread’s high-protein quality. Sweet potatoes are a popular stable of any Paleo plan. Not only are they lower in starch and calories than regular potatoes, but they are also packed to the brim with healthy vitamins and minerals. 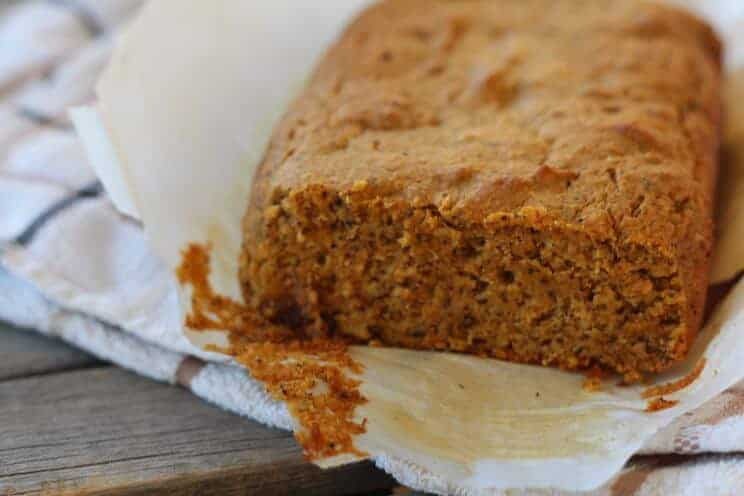 If you want to add sweet potatoes to your day but are sick of the same old recipes, try this Paleo-friendly sweet potato bread recipe. It’s moist, delectably sweet and perfect on its own or alongside a meal. Coconut and almond are definitely essential ingredients in any Paleo plan. They’re low-carb, healthy and nutrient-dense ingredients that can give any meal a great boost. 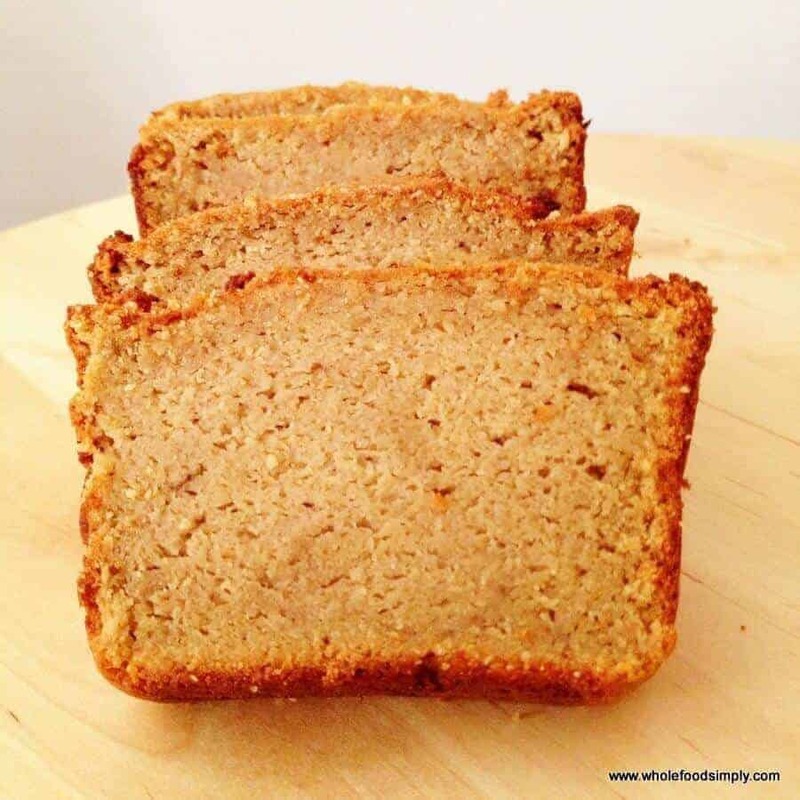 This coconut almond bread combines two Paleo staples to create a wonderful, low-carb loaf. Despite the use of coconut, the sweetness in this recipe is extremely subtle. Instead, the nutty and robust flavor of the almonds is the real star of this show. This olive oil and rosemary bread is evocative of the bread brought out in top Italian restaurants. However, its fantastic flavor isn’t even the most unique aspect of this amazing bread. What truly makes this bread special is how it’s made. Instead of baking it in the oven, you prepare it using a crockpot. This slow-cooking method allows the flavors to truly flourish. The finished product will impress even those who aren’t following a Paleo plan. 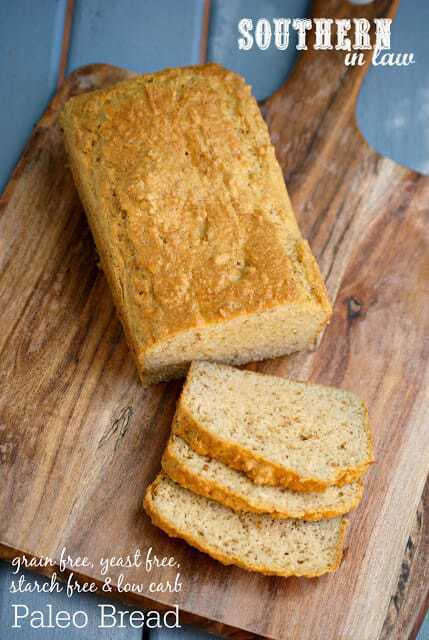 A lot of Paleo breads use mashed sweet potato or zucchini to boost flavor and texture. This interesting recipe utilizes carrots for the same purpose. The end result is a savory, very slightly sweet bread that could be used for both sandwiches and toast. 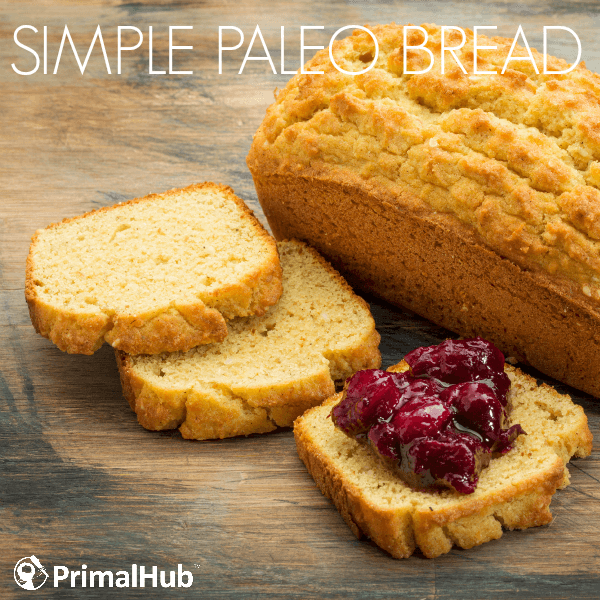 There’s nothing better than a basic Paleo bread that can be served in a myriad of ways. This basic bread is a phenomenal loaf to keep in the fridge for anyone following the Paleo plan. Pumpkin bread is a classic dish, perfect not only for the fall, but to serve alongside any hearty meal. 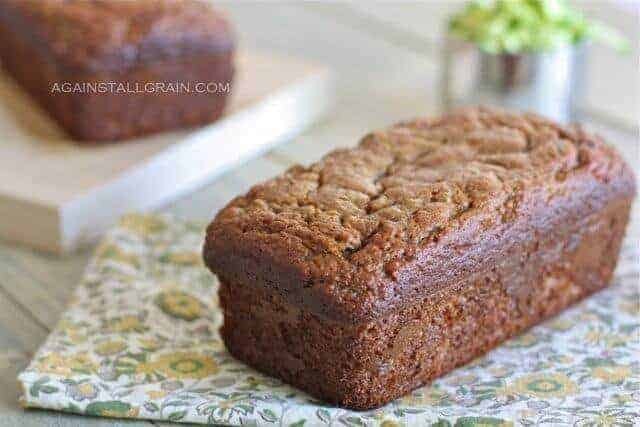 This pumpkin bread recipe is completely wheat- and gluten-free, rendering it ideal for anyone living a Paleo lifestyle. This bread uses dates, maple syrup, pecans and cinnamon to create a beautiful symphony of flavor. Enjoy it on its own with sugarless apricot jam or grass-fed butter. Or, serve it alongside a creamy Paleo soup. 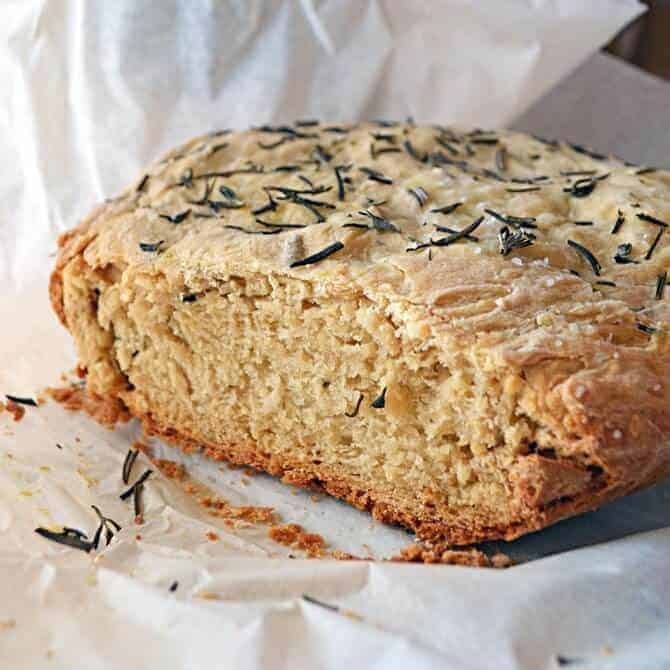 At first glance, this is a simple Paleo bread made with almond flour. However, an inspired mix of ingredients give this beautiful bread its robust and rustic flavor. This recipe uses garlic, oregano and pepper to give this bread a subtle but distinct flavor. It pairs wonderfully with savory dips like hummus, cream cheese or even mashed avocado. Thanks to its healthy ingredient list, you can enjoy an extra slice without feeling the guilt. A corned beef or pastrami sandwich just isn’t the same without a nutty and delicious rye bread. 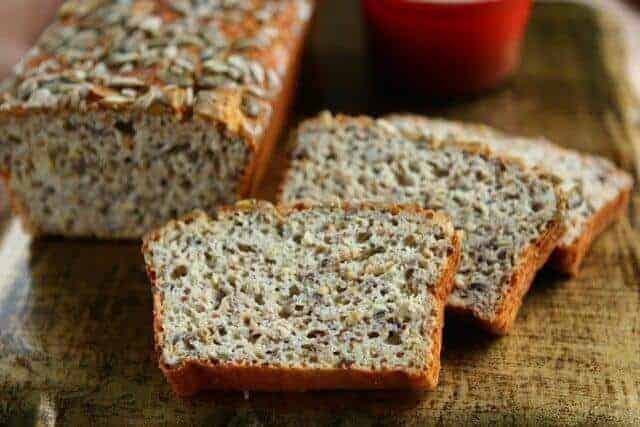 Grain-free and low-carb, this recipe is an exquisitely healthy choice for anyone with a hankering for rye bread on a Paleo plan. Caraway seeds are what give rye bread its distinctive flavor and they pair with the Paleo ingredients of this recipe excellently. 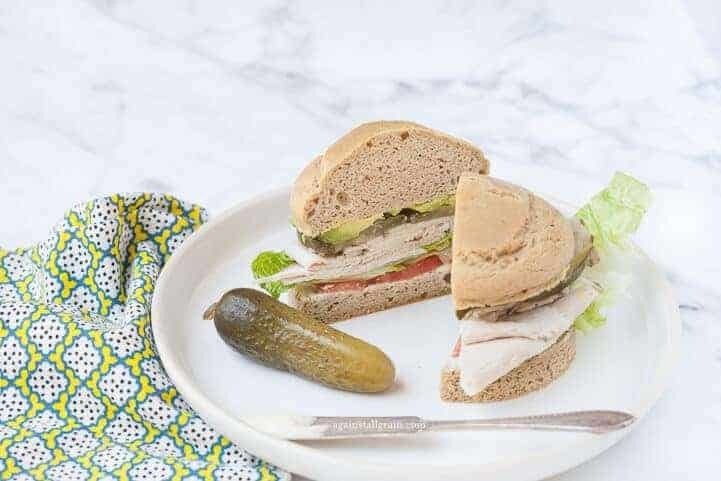 This rye bread is easy to prepare and will bring the deliciousness back to your favorite classic sandwiches. As you can see, just because you’re Paleo doesn’t mean that you have to say goodbye to bread. 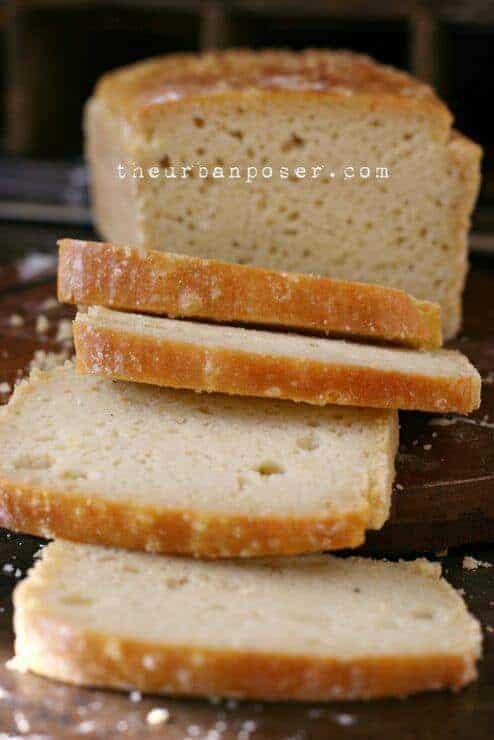 Whether you want a simple loaf for a sandwich or something as specific as classic Indian naan, there are endless recipes for Paleo versions of the breads you adore. When it comes to the Paleo lifestyle, it’s not about “giving things up.” Rather, it’s about creative substitutions that allow you to enjoy all of the foods you love, without any of the unhealthy ingredients or guilt. If you can dream it, you can make it Paleo.